Coinmach delivers hassle-free convenience by offering advanced laundry room equipment, remote monitoring systems and on-demand communications tools for management staff and residents. From energy saving machines to web-based laundry center monitoring, Coinmach serves up technology you can count on. 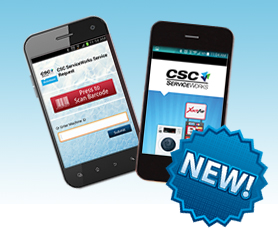 The latest in our technology and innovation is our NEW CSC ServiceWorks Service Request App. Now property managers and residents can send instant service requests with their phone. Just scan the machine’s barcode and submit – It’s that easy! Our technology now allows residents to save time doing laundry, while property managers benefit from easy maintenance and revenue reporting. Contact us today and find out more about how Coinmach’s technology can help you attract residents, retain residents, and increase ancillary income! *Some features require optional equipment.